15"Neck 32"Sleeve = Tag 38: Neck 15" Shoulder 17.2" Chest 37.8" Sleeve 32" Length 28.3" Waist 35.4"
15"Neck 33"Sleeve = Tag 39: Neck 15" Shoulder 17.6" Chest 39.4" Sleeve 33" Length 28.3" Waist 37"
15.5"Neck 33.5"Sleeve = Tag 40: Neck 15.5" Shoulder 18.1" Chest 40.9" Sleeve 33.5" Length 29.1" Waist 38.6"
16"Neck 34"Sleeve = Tag 41: Neck 16" Shoulder 18.6" Chest 42.5" Sleeve 34" Length 29.1" Waist 40.2"
16.5"Neck 35"Sleeve = Tag 42: Neck 16.5" Shoulder 19.1" Chest 44.1" Sleeve 35" Length 29.9" Waist 42.5"
17"Neck 35.5"Sleeve = Tag 43: Neck 17" Shoulder 19.5" Chest 45.7" Sleeve 35.5" Length 29.9" Waist 44.1"
17"Neck 36"Sleeve = Tag 44: Neck 17" Shoulder 20" Chest 47.2" Sleeve 36" Length 30.7" Waist 45.7"
★★★BAMBOO FIBER - Comfortable and beautiful function unit of bamboo fiber fineness, good whiteness, dyed color elegant, bright, not easy to fade, shiny, plump, stiff, elegant and generous, good drape, has a natural simple elegant texture. ★★★NO WRINKLES - Bamboo fiber can effectively prevent wrinkles, washing 20 times will not deform. Every man needs business shirts of different colors and put them in the wardrobe. 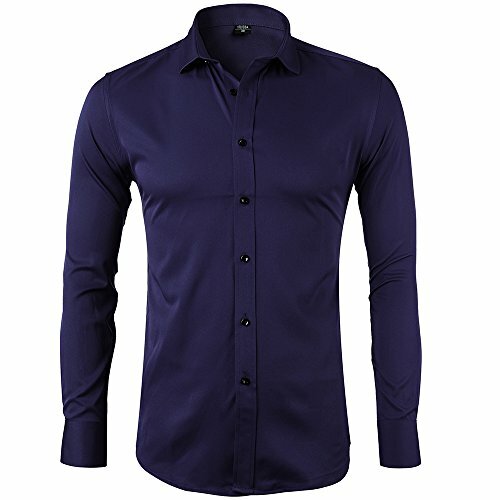 ★★★SLIM FIT - This is a SLIM FIT shirt which fits true to size but is cut differently than standard regular fit suits. Slim Fit shirts hug the body all over much tighter than a standard regular fit shirts does and gives a much tighter, slimmer, modern look. ★★★10 COLOR OPTIONS - Dress shirts no longer only white and blue. We have 10 colors to choose from, Black, Light Blue, Blue, Light Purple, White, Navy Blue, Wine Red, Red, Purple and Pink. ★★★BEST SATISFACTION GUARANTEE - We know you'll love our shirts, that's why if you aren't 100% satisfied we will provide you with a refund or replacement. If you have any questions about this product by MIYA, contact us by completing and submitting the form below. If you are looking for a specif part number, please include it with your message.